Do you hear from God? This is the question that Christians need to ask themselves today. If as a Christian you do not hear from God then you are apt to be deceived. Christians walk by revelation of the Holy Spirit through the structure of the scriptures. This is the whole thrust behind this booklet's title. Christians do not grow, progress, or truly understand by carnal reasoning and the theology of men. Many have been led astray to believe that understanding comes from commentaries and the works of scholars and the like. While it is important to literally or physically understand the scriptures and their context in history and literature, this is only the first step in true understanding. The words of scripture must be quickened by the power of the Holy Ghost. Paul the Apostle comments on this very thing. 1 Corinthians 2:1 And I, brethren, when I came to you, came not with excellency of speech or of wisdom, declaring unto you the testimony of God.2 For I determined not to know any thing among you, save Jesus Christ, and him crucified.3 And I was with you in weakness, and in fear, and in much trembling.4 And my speech and my preaching was not with enticing words of man's wisdom, but in demonstration of the Spirit and of power5 That your faith should not stand in the wisdom of men, but in the power of God. Notice that the “demonstration of the Spirit and of power” concerned Paul's “speech and preaching”. It is a reference to the power at work through his words to reach a man's heart. His words were not just men's opinions or carnal speculations but were in fact not of Paul at all. They were words given by God himself and imbued with God's power. Paul did not depend on his own education or opinions to preach the Gospel. He did not come to the Corinthians as the “great man” but rather as a humble vessel of the Lord Jesus. The Holy Ghost spoke through him to effect heaven's real and powerful change. .Jesus promised it would be this way for his ministers. That they would speak as oracles of God. His words coming through us are Spirit and they are life. Our faith rests in this power. Luke 12:11 And when they bring you unto the synagogues, and unto magistrates, and powers, take ye no thought how or what thing ye shall answer, or what ye shall say:12 For the Holy Ghost shall teach you in the same hour what ye ought to say. This is the propriety that we as ministers and ambassadors of Christ to this world should follow. Our dependence is not on our selves but a Living God. It is not on what men teach us or men's opinions but revelation of Jesus Christ. This is the Christian way of understanding. It is of the Spirit and not the carnal mind or its education. Jesus and the Apostles make this clear. 1 Corinthians 2:13 Which things also we speak, not in the words which man's wisdom teacheth, but which the Holy Ghost teacheth; comparing spiritual things with spiritual.14 But the natural man receiveth not the things of the Spirit of God: for they are foolishness unto him: neither can he know them, because they are spiritually discerned. Matthew 16:13 When Jesus came into the coasts of Caesarea Philippi, he asked his disciples, saying, Whom do men say that I the Son of man am?14 And they said, Some say that thou art John the Baptist: some, Elias; and others, Jeremias, or one of the prophets. Notice that the collective wisdom of men was wrong and based on carnal opinions, perceptions, and speculations. Jesus was not who men thought he was..
Matthew 16:15 He saith unto them, But whom say ye that I am?16 And Simon Peter answered and said, Thou art the Christ, the Son of the living God.17 And Jesus answered and said unto him, Blessed art thou, Simon Barjona: for flesh and blood hath not revealed it unto thee, but my Father which is in heaven. It was Peter who got it right and this is why he was called Peter by the Lord. Peter means “Rock” And so this was the greater ROCK after which Peter was named and on which Christ built his Church! Revelation of the Spirit! And death will not prevail against the Church in it! It is easy to see that men have returned to carnal means. Today Christianity is based on principles of theology and education that have replaced revelation. And people wonder why we are not united as Christians. We must return to the revelation of Christ as our means of truth. Until we do division and corruption will prevail and so tainting all Christian endeavor. Has any Apostle or prophet ever spoken out of opinion or conjecture in scripture? What is the difference between re3velation and theology. Discuss this with the class. What does scripture say about the carnal mind? What rock is the Church of Christ built upon? Peter said God's ministers should speak how? Revelation comes through demonstration. The realm of the Spirit is not carnally discerned. It must be demonstrated through the things that are made. The physical things testify to the spiritual things. Just as you can see a great artist through his work and come to know him in a very real way so you can see God through his creation. This is how God speaks to us in general. Physical creation is structure. It contains meaning just like your body is structure and your spirit is meaning. Through your mannerisms, eyes, voice, and the way you behave people come to know you as a unique individual. It is your spirit expressing itself through the structure of your physical form. You do not come to know a person just through the existence of a collection of body parts..You come to know them by how these body parts behave together. It is the spirit of the person inside that the body testifies to. The unseen is discerned through the seen. You see God is a Spirit. He was demonstrated to us not only in the larger picture of his creation which corresponds to the old covenant, but he was more personally demonstrated in the body of Jesus, the exact representation of his being. Through this you see the point of Jesus coming down to take on the body of a man to identify and interact with us. This is the expression of the new covenant. One covenant shows us a picture of God from the outside through structure. The new covenant reveals God from his essence or Spirit which corresponds to meaning. Another way to see these two covenants is through the Temple where the Israelites worshiped God versus the new covenant of his people “being” the temple. Worship came on the inside of us through Christ. It is true worship and not just a representation of worship like the temple and its sacrifices. John 4:21 Jesus saith unto her, Woman, believe me, the hour cometh, when ye shall neither in this mountain, nor yet at Jerusalem, worship the Father.22 Ye worship ye know not what: we know what we worship: for salvation is of the Jews.23 But the hour cometh, and now is, when the true worshippers shall worship the Father in spirit and in truth: for the Father seeketh such to worship him.24 God is a Spirit: and they that worship him must worship him in spirit and in truth. In the old covenant God spoke through the larger picture of creation and gave us structure in the law and the prophets. In the new covenant he gives us meaning in creation through Jesus. In understanding that the physical things testify to the spiritual things we come upon a precept that is set forth plainly in holy Scripture: First the physical in all things and then the spiritual. This is a pattern that God has never deviated from in both creation and revelation. The physical comes first because it is the picture. The spiritual comes next because it is the true reality. The physical is temporary and the spiritual eternal.. This has been demonstrated over and over again. Every set of brothers in the old testament shows this pattern. Cain and Abel, Ishmael and Isaac, Esau and Jacob, Peres and Zera etc. The first son is rejected, the second one accepted. The first one is physical, carnal, and sinful. The second is spiritual, of election, and righteous. This is the pattern of first the physical and then the spiritual. This all falls in the context of the old man and the new man, between Adam and Christ. 1 Corinthians 15:45 And so it is written, The first man Adam was made a living soul; the last Adam was made a quickening spirit. :46 Howbeit that was not first which is spiritual, but that which is natural; and afterward that which is spiritual.47 The first man is of the earth, earthy; the second man is the Lord from heaven. All of these old testament stories testify to this pattern that is revealed through Christ. Christ himself is the revelation of this mystery that was not revealed to previous generations as it has been now to those who are of Christ and the new covenant. The physical understanding came first in the law and the prophets. The spiritual comes only through Christ. Now we can look back in hindsight and see a new use of the old covenant in its structure. Now through Christ we get meaning. Let us look at a few examples demonstrated in these sets of brothers. What do we mean by “structure and meaning”? Discuss this with the class. What do the physical things testify to? What comes first always in this pattern? Is the concept of election physical or spiritual? Cain was the first man born of Adam and so is a picture of those who come from Adam. Abel came second and so is a picture of those who come from Christ. Cain like the Jews of the time of Jesus tried to justify himself his own way. Abel looked for God to justify him through faith. Cain made a sacrifice from the fruit of the ground. Abel from the first fruits of his flock. A sacrifice of a lamb showed innocent blood shed for sin. Cain in his jealousy killed his brother Abel because he was accepted of God (innocent blood shed). This is exactly what happened between the Jews who justified themselves by the law and Christ who looked to God to justify him. They had Jesus killed because he was accepted by God. Jesus was the first fruits of the flock and pure and without blemish. Only innocent blood can cover sin. You cannot produce your own righteousness be cause you are a sinner. We must look to God to justify us. Even in the way these two were first described in scripture you can see the truth. Genesis 4:1 And Adam knew Eve his wife; and she conceived, and bare Cain, and said, I have gotten a man from the LORD.2 And she again bare his brother Abel. And Abel was a keeper of sheep, but Cain was a tiller of the ground. Adam was the first man. He was of the earth. Christ was the second man, the Lord from heaven. Like Adam Cain got his living tilling the ground. Abel like Christ was a keeper of the sheep. Cain was under a curse just like Adam. Abel was blessed through his dependence and obedience. Genesis 3:17 And unto Adam he said, Because thou hast hearkened unto the voice of thy wife, and hast eaten of the tree, of which I commanded thee, saying, Thou shalt not eat of it: cursed is the ground for thy sake; in sorrow shalt thou eat of it all the days of thy life;18 Thorns also and thistles shall it bring forth to thee; and thou shalt eat the herb of the field;19 In the sweat of thy face shalt thou eat bread, till thou return unto the ground; for out of it wast thou taken: for dust thou art, and unto dust shalt thou return. John 3:31 He that cometh from above is above all: he that is of the earth is earthly, and speaketh of the earth: he that cometh from heaven is above all.32 And what he hath seen and heard, that he testifieth; and no man receiveth his testimony. The point is clear that those of the earth, of flesh, (flesh is the fruit of the ground) are under a curse. But those of above are blessed. This is the teaching of Heaven and Earth. Heaven is spirit and eternal and the earth is dust, physical and temporary just like the body is of dust and the spirit is of God. The teaching or meaning that has been hidden within the structure of these bible passages is clear. This teaching testifies to Christ. Galatians 4:22 For it is written, that Abraham had two sons, the one by a bondmaid, the other by a freewoman.23 But he who was of the bondwoman was born after the flesh; but he of the freewoman was by promise. Galatians 4:29 But as then he that was born after the flesh persecuted him that was born after the Spirit, even so it is now.Galatians 4:30 Nevertheless what saith the scripture? Cast out the bondwoman and her son: for the son of the bondwoman shall not be heir with the son of the freewoman. You can see that Isaac and Ishmael picture flesh and spirit. Ishmael came first and was rejected. Isaac came next and was accepted. Ismael persecuted Isaac just like the Jews persecuted Christ. (Like Cain and Abel). It is obvious that there is a strong comparison to Isaac and Christ. Both came about by the power of God. Both came in God's time not man's. Both came by God keeping his promise. Through both Abraham is blessed. Isaac physically and Christ spiritually. Through both come the descendants of Abraham. Christ is the true child of promise of which Isaac was only a figure or picture. It was Jesus and not Isaac that is the true seed. The seed is not that of a carnal man but of an eternal one. Romans 9:7 Neither, because they are the seed of Abraham, are they all children: but, In Isaac shall thy seed be called.8 That is, They which are the children of the flesh, these are not the children of God: but the children of the promise are counted for the seed. The promise shown through Isaac is that Christ is the seed and we must be counted in him to be children of the promise. In other words we must be counted according to the spirit instead of the flesh. Ishmael was under a curse like Adam. He came first but was not counted as first. Ishmael pictures those born of Adam. They are flesh and cannot inherit with the free woman's son. In Esau and Jacob we see the exact same pattern. Esau was a man of the field (flesh) and Jacob was a quiet man dwelling in a tent.(spirit). The tent or tabernacle of this body in which the spirit dwells is talked about in scripture expressly. Esau came out of the womb first and Jacob second but Jacob came out grasping Esau's heel. In other words they were two that came out of the womb as one. This pictures the soul for body and spirit together make a living soul. Esau despised his birth right. The birth right is the right to be first. He sold it to Jacob for food. to fill his stomach (flesh). Though Esau came first he was counted as last. Jacob was counted as first though he came second. He later received the blessing of his father Isaac in place of Esau. This fulfills the pattern of God. The Spirit comes second but is counted as first. The flesh comes first but is counted as last. This is the principle of “the last will be first but the first will be last”. We will discuss this principle more later. Esau repented with tears over losing his blessing but could find no repentance. There is no repentance for the flesh. Genesis 25:21 And Isaac intreated the LORD for his wife, because she was barren: and the LORD was intreated of him, and Rebekah his wife conceived.22 And the children struggled together within her; and she said, If it be so, why am I thus? And she went to enquire of the LORD.23 And the LORD said unto her, Two nations are in thy womb, and two manner of people shall be separated from thy bowels; and the one people shall be stronger than the other people; and the elder shall serve the younger. So just as Esau did serve Jacob and just as Israel became stronger than Edom so the Spirit becomes greater than flesh. The elder (flesh) does serve the younger (spirit) through Christ. This helps us immensely in understanding the phrase “ Jacob I have loved but Esau I have hated”. Malachi 1:2 I have loved you, saith the LORD. Yet ye say, Wherein hast thou loved us? Was not Esau Jacob's brother? saith the LORD: yet I loved Jacob,3 And I hated Esau, and laid his mountains and his heritage waste for the dragons of the wilderness. It wasn't just these two men God was speaking of but rather what they represented. God hates the ways of the flesh and loves the way of the Spirit. The spirit is not self sufficient or self justifying like Esau, but rather dependent and humble like Jacob: A quiet man who lived in a tent. God's purpose is according to the spirit and the eternal and it always was. What do Cain and Abel represent? What is the “fruit of the ground? What does Esau and Jacob represent? Who does Isaac picture? Discuss this with the class. What do Adam and Cain have in common? This brings us to the principle “ the last will be first and the first will be last”. This can be demonstrated in a multitude of pictures from the scriptures. Let us start with a basic demonstration of this principle. The soul remember is comprised of body and spirit together as one. In the making of a soul we start with the body and then add the spirit. The flesh comes first in this order to testify to what comes next. You can see this between Adam and Christ. Adam was a picture of he that was to come. The flesh is rejected and the Spirit accepted. We are talking about the difference in the natural man and the new or spiritual man. This happens in every person who is born again after the spirit. The flesh is rejected and life is counted according to the spirit. The old man or nature is crucified with Christ through faith in the sacrifice. At that point through faith is is no longer we who live but Christ who lives in us. So the flesh or Adam is rejected and the spirit or Christ is accepted. There is a promise though for the body to be redeemed at the end. This is the hope of the resurrection. So hence the “last will be first and the first will be last. 1 Corinthians 15:45 And so it is written, The first man Adam was made a living soul; the last Adam was made a quickening spirit.46 Howbeit that was not first which is spiritual, but that which is natural; and afterward that which is spiritual.47 The first man is of the earth, earthy; the second man is the Lord from heaven.48 As is the earthy, such are they also that are earthy: and as is the heavenly, such are they also that are heavenly.49 And as we have borne the image of the earthy, we shall also bear the image of the heavenly.50 Now this I say, brethren, that flesh and blood cannot inherit the kingdom of God; neither doth corruption inherit incorruption. 51 Behold, I shew you a mystery; We shall not all sleep, but we shall all be changed,52 In a moment, in the twinkling of an eye, at the last trump: for the trumpet shall sound, and the dead shall be raised incorruptible, and we shall be changed.53 For this corruptible must put on incorruption, and this mortal must put on immortality. The summation of this principle is the body or physical comes first, but the spirit who comes next is redeemed or reconciled first. The body is redeemed last. The physical is reconciled to the spiritual through the resurrection. This principle is further demonstrated through John the baptist and Christ. John came first to testify to who came next. John spoke as one from below to testify to the one who comes from above. Jesus came second but is preferred as first. Mark 1:7 And preached, saying, There cometh one mightier than I after me, the latchet of whose shoes I am not worthy to stoop down and unloose.8 I indeed have baptized you with water: but he shall baptize you with the Holy Ghost. John 3:28 Ye yourselves bear me witness, that I said, I am not the Christ, but that I am sent before him.29 He that hath the bride is the bridegroom: but the friend of the bridegroom, which standeth and heareth him, rejoiceth greatly because of the bridegroom's voice: this my joy therefore is fulfilled.30 He must increase, but I must decrease.31 He that cometh from above is above all: he that is of the earth is earthly, and speaketh of the earth: he that cometh from heaven is above all.32 And what he hath seen and heard, that he testifieth; and no man receiveth his testimony. Those “least” in the kingdom of God are those born of the Spirit or those born from above. No man of the earth was greater than John, but he was of the earth and not from above. Until Jesus actually died no one could be “born again”. So John shows the physical and Christ the spiritual. The physical comes first to prepare the way for the spiritual. The temporary testifies to the eternal. When the eternal arrives the temporary is dispensed with. 1 Corinthians 15:47 The first man is of the earth, earthy; the second man is the Lord from heaven.48 As is the earthy, such are they also that are earthy: and as is the heavenly, such are they also that are heavenly. Your life has followed this same pattern if you are a Christian. First you born according to Adam and then you were born again according to Christ. When you were born again in faith your old life ceased and your spiritual life began. You reckoned yourself dead to sin and alive to God through Jesus Christ. You counted your body dead and buried by baptism with Christ. Your natural life was only a forerunner to the new life of Christ. Now your hope is that your body will be redeemed in the resurrection at Jesus' return. The last will be first and the first will be last in you! John 3:5 Jesus answered, Verily, verily, I say unto thee, Except a man be born of water and of the Spirit, he cannot enter into the kingdom of God.6 That which is born of the flesh is flesh; and that which is born of the Spirit is spirit. 1 Corinthians 15:42 So also is the resurrection of the dead. It is sown in corruption; it is raised in incorruption:43 It is sown in dishonour; it is raised in glory: it is sown in weakness; it is raised in power: 44 It is sown a natural body; it is raised a spiritual body. There is a natural body, and there is a spiritual body. How does this apply to 1Corinthians 15:44-49 ? Discuss this with the class. There is another facet to this gem of spiritual understanding. It also refers to humility and exaltation. The flesh exalts itself. The spirit humbles itself. Those who are of Adam exalt themselves and justify themselves. They always seek to be first. Those who are of Christ humble themselves and depend on God in submission to his will. They are servants. It is God who both justifies and exalts them. Adam tried to exalt himself, and then when he fell he tried to justify himself. Christ depended on God. Jesus humbled himself and God raised him up. It is the Father who testifies to the son. John 5:31 If I bear witness of myself, my witness is not true.32 There is another that beareth witness of me; and I know that the witness which he witnesseth of me is true. So we see in this principle of “the last will be first and the first will be last” ss that salvation is not something you can attain yourself by your own will but rather it is a gift of God through your submission to his will in faith through Jesus whom he sent. If you humble yourself God will exalt you. If you exalt your self you will be humbled. Mark 9:33 And he came to Capernaum: and being in the house he asked them, What was it that ye disputed among yourselves by the way?34 But they held their peace: for by the way they had disputed among themselves, who should be the greatest.35 And he sat down, and called the twelve, and saith unto them, If any man desire to be first, the same shall be last of all, and servant of all. Revelation of the Spirit is how we are led by God. Not theology, speculations or men's opinions. 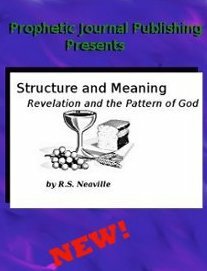 God works by a pattern of structure and meaning. (physical and spiritual) and has never deviated from it. First comes the physical, natural, and temporary, then comes the spiritual, supernatural, and eternal in all things. This is true in both creation and revelation. The physical or natural comes first to testify and prepare the way for what comes next. The temporary pictures the eternal. . The last will be first and the first will be last. These are the basic foundations of the pattern of God. Discuss this review with the class. Section Five: Some Examples of the Pattern. For every physical act or event recorded in scripture there is a hidden spiritual meaning. It is revealed according to this pattern of structure and meaning by the Spirit of Christ. It is revelation of God! Structure is what is seen. Meaning is what is contained within structure. For example: A bottle of wine is a good picture. The structure is the bottle and the wine is the meaning. The shape of the bottle and the label tell you what is inside. The physical testifies to the spiritual in this way. As a Christian you could say that what you are is demonstrated through what you do. In other words your form or shape. Your testimony is like your label. This is the truth of you though is what is contained in this form and underneath the label. You are a spirit in a body. In the same way form testifies to function and so structure testifies to meaning. The Law of Moses is another good example. The letter of the Law is the structure. The spirit of the law is the meaning. Romans 2:27 And shall not uncircumcision which is by nature, if it fulfil the law, judge thee, who by the letter and circumcision dost transgress the law?28 For he is not a Jew, which is one outwardly; neither is that circumcision, which is outward in the flesh:29 But he is a Jew, which is one inwardly; and circumcision is that of the heart, in the spirit, and not in the letter; whose praise is not of men, but of God. Romans 8:1 There is therefore now no condemnation to them which are in Christ Jesus, who walk not after the flesh, but after the Spirit.2 For the law of the Spirit of life in Christ Jesus hath made me free from the law of sin and death. The structure of the Law cannot save you but the meaning within can! The letter brings death but the Spirit brings life. Genesis 40:5 And they dreamed a dream both of them, each man his dream in one night, each man according to the interpretation of his dream, the butler and the baker of the king of Egypt, which were bound in the prison.6 And Joseph came in unto them in the morning, and looked upon them, and, behold, they were sad.7 And he asked Pharaoh's officers that were with him in the ward of his lord's house, saying, Wherefore look ye so sadly to day?8 And they said unto him, We have dreamed a dream, and there is no interpreter of it. And Joseph said unto them, Do not interpretations belong to God? tell me them, I pray you.9 And the chief butler told his dream to Joseph, and said to him, In my dream, behold, a vine was before me;10 And in the vine were three branches: and it was as though it budded, and her blossoms shot forth; and the clusters thereof brought forth ripe grapes:11 And Pharaoh's cup was in my hand: and I took the grapes, and pressed them into Pharaoh's cup, and I gave the cup into Pharaoh's hand.12 And Joseph said unto him, This is the interpretation of it: The three branches are three days:13 Yet within three days shall Pharaoh lift up thine head, and restore thee unto thy place: and thou shalt deliver Pharaoh's cup into his hand, after the former manner when thou wast his butler. The Baker was hung. Jesus body was hung on a cross for us. When we receive Jesus as our savior our spirit is regenerated and our body condemned to death. When Jesus died and rose again after those three days all who died in faith up to that point spiritually went with Christ into heaven. Their bodies along with their sin natures were left in the grave. Sin is condemned in sinful flesh. When the bodies are destroyed in the grave the the sin nature dies. Genesis 40:16 When the chief baker saw that the interpretation was good, he said unto Joseph, I also was in my dream, and, behold, I had three white baskets on my head:17 And in the uppermost basket there was of all manner of bakemeats for Pharaoh; and the birds did eat them out of the basket upon my head.18 And Joseph answered and said, This is the interpretation thereof: The three baskets are three days:19 Yet within three days shall Pharaoh lift up thy head from off thee, and shall hang thee on a tree; and the birds shall eat thy flesh from off thee.20 And it came to pass the third day, which was Pharaoh's birthday, that he made a feast unto all his servants: and he lifted up the head of the chief butler and of the chief baker among his servants.21 And he restored the chief butler unto his butlership again; and he gave the cup into Pharaoh's hand:22 But he hanged the chief baker: as Joseph had interpreted to them. The chief Baker like our sin nature was under a curse. Jesus was hung from a tree as the chief baker was. Jesus became a curse for us so our bodies could be redeemed later after the sin nature was destroyed in the grave. This is the hope of the resurrection. Romans 6:5 For if we have been planted together in the likeness of his death, we shall be also in the likeness of his resurrection:6 Knowing this, that our old man is crucified with him, that the body of sin might be destroyed, that henceforth we should not serve sin. So we can see now through this pattern by revelation of Christ that this story is really about our redemption through Christ. There is obviously more to this picture but this will suffice to show the example. The butler and the baker together picture one man in body and spirit. The event described shows the pattern of our redemption. First the spirit is reconciled to God and then the body is redeemed later. The body must die in order for the sin nature to be destroyed for sin is condemned in the body. Our spirits can now enter the presence of God through faith to commune with him by means of the cup of wine which pictures Jesus' blood of the new covenant. In the gospel of Luke Jesus relates to his disciples a similar example of this concept. Luke 16:19 There was a certain rich man, which was clothed in purple and fine linen, and fared sumptuously every day:20 And there was a certain beggar named Lazarus, which was laid at his gate, full of sores,21 And desiring to be fed with the crumbs which fell from the rich man's table: moreover the dogs came and licked his sores.22 And it came to pass, that the beggar died, and was carried by the angels into Abraham's bosom: the rich man also died, and was buried;23 And in hell he lift up his eyes, being in torments, and seeth Abraham afar off, and Lazarus in his bosom. Notice that these two men died the same day. Lazarus was carried to Abraham's bosom (paradise) by angels, but the rich man was buried. Do you the see the similarity between the Butler and the Baker from Genesis 40? The rich man and Lazarus are the same man. The body with the sin nature is buried in the grave (hell) and the spirit is separated to a place of comfort. There is an exchange between the sin nature (rich man) and Abraham (a picture of God). Luke 16:24 And he cried and said, Father Abraham, have mercy on me, and send Lazarus, that he may dip the tip of his finger in water, and cool my tongue; for I am tormented in this flame.25 But Abraham said, Son, remember that thou in thy lifetime receivedst thy good things, and likewise Lazarus evil things: but now he is comforted, and thou art tormented.26 And beside all this, between us and you there is a great gulf fixed: so that they which would pass from hence to you cannot; neither can they pass to us, that would come from thence. Can you compare this conversation with the one that is going on in you as a Christian. Think of it. Your body , and so your sin nature is reckoned dead and your spirit is reckoned alive to God. Romans 6:11 Likewise reckon ye also yourselves to be dead indeed unto sin, but alive unto God through Jesus Christ our Lord.12 Let not sin therefore reign in your mortal body, that ye should obey it in the lusts thereof. Your sin nature is the rich man according to the flesh. It burns with lust to express itself through the members of your body. As a Christian you no longer yield your members to sin or the sin nature. You count that nature dead and buried like the rich man. When your sin nature ruled you then your spirit was deprived like Lazarus. Now you as a Christian are comforted but the the sin nature is in agony. It longs to use those members again to fulfill its lust.
. Luke 16:24 And he cried and said, Father Abraham, have mercy on me, and send Lazarus, that he may dip the tip of his finger in water, and cool my tongue; for I am tormented in this flame. James 3:5 Even so the tongue is a little member, and boasteth great things. Behold, how great a matter a little fire kindleth!6 And the tongue is a fire, a world of iniquity: so is the tongue among our members, that it defileth the whole body, and setteth on fire the course of nature; and it is set on fire of hell. Notice also that the spirit has the name, and the flesh does not. The spirit is called Lazarus, the sin nature is called merely “the rich man”. The spirit is who you truly are. There is a lot more to the teaching about the rich man and Lazarus, but this is enough for our purposes here. Study this chapter with these keys and see what God the Father will reveal to you. We Christian walk by humility to achieve God's favor. If we want to be great in God's kingdom we must humble ourselves and serve even as Christ served. God exalts those who humble themselves. God also brings down everyone who exalts themselves. Again last is considered first and first last. Then cried Jesus in the temple as he taught, saying, Ye both know me, and ye know whence I am: and I am not come of myself, but he that sent me is true, whom ye know not. But I know him: for I am from him, and he hath sent me. Then they sought to take him: but no man laid hands on him, because his hour was not yet come. And as they did eat, Jesus took bread, and blessed, and brake it, and gave to them, and said, Take, eat: this is my body. And he took the cup, and when he had given thanks, he gave it to them: and they all drank of it. And he said unto them, This is my blood of the new testament, which is shed for many. Verily I say unto you, I will drink no more of the fruit of the vine, until that day that I drink it new in the kingdom of God. Having established the meaning of the wine and of Jesus' hour, we can now see that in this, his first miracle, is revealed a picture of Jesus as the lamb of God. And there were set there six waterpots of stone, after the manner of the purifying of the Jews, containing two or three firkins apiece. Jesus saith unto them, Fill the waterpots with water. And they filled them up to the brim. And he saith unto them, Draw out now, and bear unto the governor of the feast. And they bare it. Notice the water pots that Jesus chose for his water made wine. These were vessels used in the purification rites as described in the law. If a person touched a dead body, or if they were deemed unclean for some reason as pertaining to the law, they would go to the priest for help to be made clean according to the law (Leviticus 13:6). The priest would give them instructions concerning the washing and the accompanying ceremony. When the ruler of the feast had tasted the water that was made wine, and knew not whence it was: (but the servants which drew the water knew;) the governor of the feast called the bridegroom, And saith unto him, Every man at the beginning doth set forth good wine; and when men have well drunk, then that which is worse: but thou hast kept the good wine until now. This beginning of miracles did Jesus in Cana of Galilee, and manifested forth his glory; and his disciples believed on him. The ruler of the feast approached the bridegroom to comment on the "good" wine and remarked on how most men serve the best wine first. We know from scripture that Jesus is often called the bridegroom. Though he was not literally so in this case, the bridegroom is still figurative of Christ in this passage. But into the second went the high priest alone once every year, not without blood, which he offered for himself, and for the errors of the people: The Holy Ghost this signifying, that the way into the holiest of all was not yet made manifest, while as the first tabernacle was yet standing: Which was a figure for the time then present, in which were offered both gifts and sacrifices, that could not make him that did the service perfect, as pertaining to the conscience; Which stood only in meats and drinks, and divers washings, and carnal ordinances, imposed on them until the time of reformation. But Christ being come an high priest of good things to come, by a greater and more perfect tabernacle, not made with hands, that is to say, not of this building; Nether by the blood of goats and calves, but by his own blood he entered in once into the holy place, having obtained eternal redemption for us. For if the blood of bulls and of goats, and the ashes of an heifer sprinkling the unclean, sanctifieth to the purifying of the flesh: How much more shall the blood of Christ, who through the eternal Spirit offered himself without spot to God, purge your conscience from dead works to serve the living God? In this first miracle of Jesus we see the man and his mission, to shed his blood for mankind and cleanse them from all unrighteousness. Once again we see the concept of "first and last" reveal a precious truth about our Savior and our salvation. This brings us to an overall concept that is important for all Christians to understand. It was always God's purpose and plan to justify mankind through through Christ. Adam was not the man God intended. This mystery is revealed through Christ at his first advent. That was the time for the spiritual or eternal to be made known to man. This is the true predestination the bible speaks of. Ephesians 1:3 Blessed be the God and Father of our Lord Jesus Christ, who hath blessed us with all spiritual blessings in heavenly places in Christ::4 According as he hath chosen us in him before the foundation of the world, that we should be holy and without blame before him in love:5 Having predestinated us unto the adoption of children by Jesus Christ to himself, according to the good pleasure of his will,6 To the praise of the glory of his grace, wherein he hath made us accepted in the beloved. God had always meant to bring us into the eternal. Adam was only a transition and a picture of he who was to come. Jesus was there fore considered slain before the foundations of the world were laid. Mankind was predestined to be adopted into the eternal from the physical through Christ. This pattern confirms it through out the scripture. “The last will be first and the first will be last”. 1 Corinthians 15:44 It is sown a natural body; it is raised a spiritual body. There is a natural body, and there is a spiritual body.45 And so it is written, The first man Adam was made a living soul; the last Adam was made a quickening spirit.46 Howbeit that was not first which is spiritual, but that which is natural; and afterward that which is spiritual.47 The first man is of the earth, earthy; the second man is the Lord from heaven.48 As is the earthy, such are they also that are earthy: and as is the heavenly, such are they also that are heavenly.49 And as we have borne the image of the earthy, we shall also bear the image of the heavenly. What do the Butler and Baker represent in Genesis 40? Is wine representative of Spirit? Discuss this with the class. What does Lazarus represent in Luke 16? What is the “cheaper wine” in John 2? Who is the bride groom in John 2 a picture of? February 25, 2009. by R.S. Neaville. *All rights reserved.. All Bible verses taken from KJV.